Overall: Peer Recovery Support Services, health and wellness workshops, events and activities and community events and awareness. We encourage the community or anyone seeking help or offer support to the recovery community to call or walk in a brief form will help capture basic contact information. Peers looking for support are encouraged to call the recovery center as soon as possible so we can begin telephone recovery support immediately. Our mission is to educate, support, and guide individuals, families and the community affected by substance use disorder in the recovery process. We envision a substance-free environment that will empower individuals to initiate recovery, as well as enhance opportunities for individuals to sustain recovery. 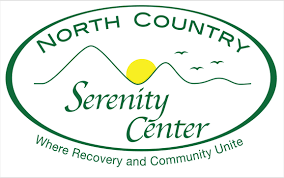 In 2011 a man in long-term recovery began to establish the North Country Serenity Center. He worked with a Board of Directors to establish the name and non-profit status. Over the years many people from the recovery community and the local communities have participated to educate and hold recovery events in the area. Over time the center began to create a life of its own yet funding held back from the dream coming true. Finally, in 2016 we were given the opportunity to interview with the state’s PRSS Facilitating Organization and determined we had the capacity to open a recovery community center in Littleton.